1. I definitely did not create Muse in isolation from the rest of the story games community. I’ve played many of the new breed of games. I definitely have heard of Universalis (although I couldn’t seem to buy the rules in Canada and had to content myself with what I could glean from reading reviews). 2. I don’t consider Muse a Role-Playing Game myself, so I agree with your review. I call Muse a Storytelling Game (STG). Regarding point one, at what stage of the development of Muse did you come in contact with the story games community? I got the impression that you at least started the development of Muse in isolation. And I thought it interesting that you arrived at something so similar (but yet quite different) to the grand daddy Universalis. As for point three, when i first started reading I was also thinking that it was a GM-less game, but when I saw that there was no “acting as your character” bits, and the stuff the actual player did was more along the lines of what GMs do, I changed my mind. This is the first player-less “RPG” I’ve seen. In our circles we have jested about such a game, where no meddling players can get in the way of the awesome, it was very cool to see that the game actually exists. For yet another game that leans on very similar fundamental ideas, yet plays completely differently, you could take a look at my game While the World Ends (multiple actual play reports are linked in the Index of gaming posts in the left side bar). The shared world building, character goals and the “Will this be fun to play?” question, are shared elements of both games. 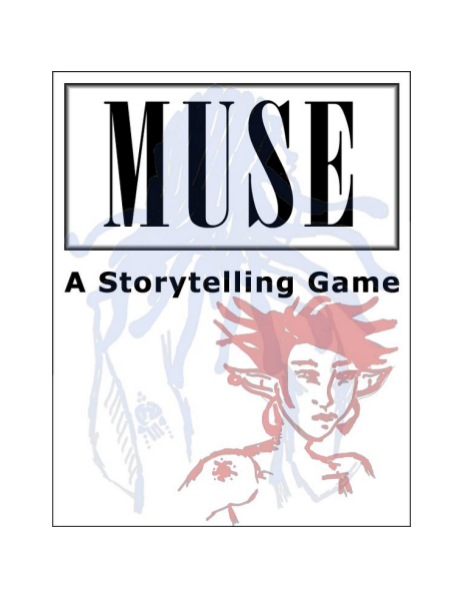 It was my contact with the story games community that inspired me to write Muse. I was inspired by how people were no longer content with the idea that “a good GM is one that ignores the rules.” I wanted to become a part of the dialogue. I wanted to create a game where the rules created exactly the kind of game I liked to play. I enjoyed reading this, too. What a nice review! I agree with your comments about it “not being a roleplaying game”. Take this with a grain of salt, because I haven’t played Universalis, but I think Muse is a much simpler/quicker-to-learn game. The rules are very simple, and can be learned as you play. I wonder about the comment that the card rules seem convoluted. I’m probably too close to the game to judge, but it seems to me that they are really, really simple. (It’s always, “Highest card wins,” with the possibility to play a card if you’re losing, which is called “Turning the tides”, and that’s almost the entirety of the card rules right there.) Wilhelm, is there perhaps something about the presentation that makes them appear more arcane than they are? I don’t see any big difference in complexity between Universalis (which I have played) and Muse (which I have not played), The Universalis rules text is thicker, but there’s less text on each page, as for reading them I think they are about the same in actual length (maybe that Universalis is a bit longer). If it was my game I’d take a good look at the Q&A section, is it there because it is easy to miss how those rules work? Could they be answered in their respective sections of the main text, with good headlines to make easier reference? Also, I think a one page cheat sheet would help both teaching and learning the game. Easy to follow bullet point-style explanations of how the game is played, what the active player does, what the listeners do, and how the cards are used. With that said, read my “review” in the context of the “Reading games” article in the left hand bar. The “grades” for Setting, Rules and Form in the Conclusion don’t really say anything about how I liked the game, but rather how clear and detailed the game is in those three areas. The Will I play it? is frightfully short term, there are games that I have said never-ever about that hit the table just months later, and games i vowed to play that I don’t fancy any longer. I don’t post any Playing X articles unless I have played or run the game at least three times since I want to feel that any experiences I’ve had aren’t flukes, and most games only see the table once. So the ratio of them is also a bit misleading as for what I actually play. Thanks for showing an interest in my work, Paul. Regarding the diagrams, I’m quite sure there are no errors. I do believe my text could benefit from a play example of an entire game. That might help to clear up your confusion. Otherwise, if you can tell me the exact paragraphs you’re finding difficult I can see if I can improve them. Adding The Q&A section was an active decision meant to make the rules easier to read. It covers unusual cases, which if included in the main rules would only serve to make them more difficult to understand.